Dan Wheldon, two-time champion of the Indianapolis 500 including this year's race, has died today after a massive crash in which 15 cars were involved in the IndyCar 2011 finale at Las Vegas Motor Speedway. Drivers were concerned about the very high speeds in practice for today's race and how it could lead to a dangerous wreck, which it did and took the life of Wheldon. 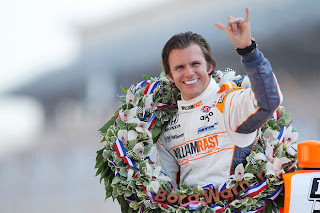 Wheldon started today's race dead last and at the point of the crash had gained ten spots and he was racing for a $5 million payday if he were to win. He was 33 years old. Rest in peace. Here is the crash that took Wheldon's life. Viewer discretion is advised.